American fashion designer Tory Burch’s footwear collection is a mix of casual, cool designs, and tributes to eras and styles. The Miller collection of Tory Burch sandals carries a signature leather thong and comes in various alluring colors. 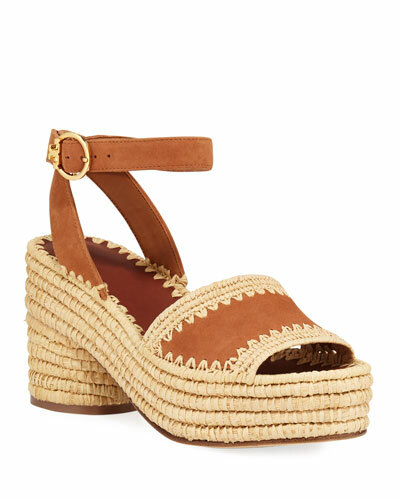 The line also features the Gigi low-heel pumps, designed as a tribute to the free-spirited ’60s. The Tory Burch collection is always set to surprise you with its versatile and incredibly trendy designs. The extensive collection features Tory Burch boots, floral slip-on sneakers, jeweled thong sandals, and suede booties. Check out the diverse range of Tory Burch footwear, including sandals, ballerina flats, suede booties, and more at Neiman Marcus. Tory Sport "Banner" sock-fit sneakers in performance knit with supportive cage. 1" molded heel. Round toe. Logo webbing. Pull-on style. Tory Sport "Banner" sock-fit sneakers in performance knit with supportive cage. 1" molded heel. Round toe. Logo webbing. Pull-on style. Rubber sole. Imported.